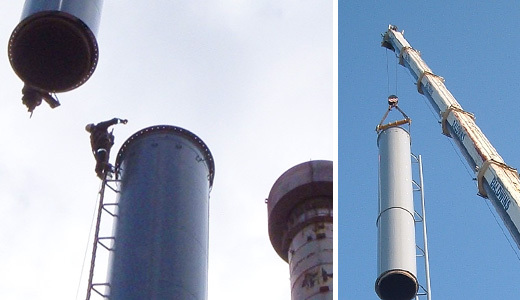 We design and erect new steel chimneys, replacement liners for both steel and concrete chimneys, ducting design and installation, access ladders and platforms. Repairs and maintenance also fall within our remit, and where this is not feasible we undertake the demolition of the existing chimney. This is in itself a complex operation as the chimneys can be up to 6500mm in diameter with each section running to 50m in length. Coupled with the fact that the chimneys are often in the proximity of other plant and facilities, this places considerable emphasis on completing the process with the minimum of disruption and the greatest of care.